BRIDGETOWN, Barbados, Jun 30 2017 (IPS) - The tourism industry is the key economic driver and largest provider of jobs in the Caribbean after the public sector. Caribbean tourism broke new ground in 2016, surpassing 29 million arrivals for the first time and once again growing faster than the global average. Visitor expenditures also hit a new high, growing by an estimated 3.5 per cent to reach 35.5 billion dollars. And the the outlook for 2017 remains rosy, with expected increases of 2.5 and 3.5 percent in long-stay arrivals and between 1.5 per cent and 2.5 percent in cruise passenger arrivals. A 460,000-euro grant from the Caribbean Development Bank (CDB) will increase the tourism sector’s resilience to natural hazards and climate-related risks. But tourism officials say Caribbean islands are significantly affected by drastic changes in weather conditions and they fear climate change could have a devastating impact on the industry. They note that the Caribbean tourism sector faces significant future threats related to both competitiveness and climate change impacts. And for a region so heavily dependent on coastal- and marine-related tourism attractions, adaptation and resilience are critical issues facing Caribbean tourism. “The impact of more severe hurricanes and the destruction of our most valued tourism assets, our beaches and coral reefs, and the damage to our infrastructure threaten to reverse the developmental gains that we have made,” Dominican Senator Francine Baron said. Baron, who serves as Dominica’s Minister of Foreign Affairs, made the comments as she addressed a forum on the issue of climate change at the general assembly of the Organization of American States (OAS) held in Mexico recently. In the face of these threats, the Caribbean Tourism Organization (CTO), the Caribbean’s tourism development agency, has received a much-needed boost with a 460,000-euro grant from the Caribbean Development Bank (CDB) to implement a project to increase the Caribbean tourism sector’s resilience to natural hazards and climate related risks. “Global climate change and its impacts, including the increasing frequency and severity of extreme weather events, pose a significant risk to the Caribbean region and threaten the sustainability of Caribbean tourism,” the CTO’s Secretary General Hugh Riley said. The CDB/CTO partnership was formalized at a signing ceremony held on June 22 at CDB’s headquarters in Barbados. Speaking at the event, CDB President Dr. Warren Smith noted that the tourism sector makes an enormous contribution to the region’s socioeconomic development. “Tourism generates high levels of employment, foreign direct investment and foreign exchange for our borrowing member countries and, given its multi-sectoral nature, it is a very effective tool for promoting sustainable development and poverty reduction,” Dr. Smith said. 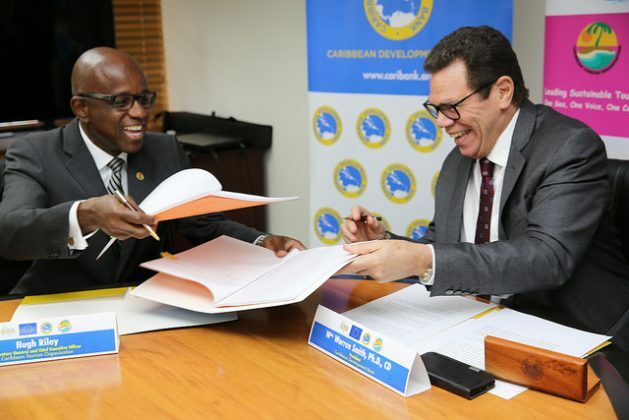 Funding is being provided under the African Caribbean Pacific-European Union-Caribbean Development Bank-Natural Disaster Risk Management in CARIFORUM Countries programme, which aims to reduce vulnerability to long-term impacts of natural hazards, including the potential impacts of climate change, thereby achieving national and regional sustainable development and poverty reduction goals in those countries. During the 19-month project implementation period, the CTO will support the region’s tourism entities with policy formulation, the promotion of best practices in disaster risk management and climate change adaptation, and the development of tools to enhance the tourism sector’s knowledge and awareness of disaster risk reduction strategies and the potential impacts of climate variability and climate change (CVC). A training component will also be included to strengthen the ability of public and private sector tourism stakeholders to undertake adequate mitigation and adaptation actions to CVC. The CTO secretariat will also benefit from institutional strengthening to help provide technical assistance and ongoing support for tourism-related climate services. The project is in keeping with 2017 as the International Year of Sustainable Tourism for Development, which has been designated by the United Nations General Assembly. At the CDB’s Annual Board of Directors meeting held in Turks and Caicos Islands last month, Governors noted the acute environmental vulnerability of the Region and urged CDB to continue to play an important role in helping its Borrowing Member Countries (BMCs) build resilience. Smith said CDB’s commitment to this role was evidenced during the meeting, at which CDB signed an agreement with the European Investment Bank (EIB) for the second Climate Action Line of Credit (CALC). “This will facilitate increased climate proofing of critical infrastructure in the Caribbean. The Line of Credit for Euro 100 million is the largest single loan made by EIB in our region. We are very encouraged by the strong statement of confidence in CDB that this line represents,” he said. Eligible investments under the Climate Action Framework Loan II include climate change mitigation, adaptation and resilience projects in renewable energy, energy efficiency, road transport, water infrastructure and community-level physical and social infrastructure that reduce greenhouse gas emissions and improve resilience to the impacts of climate change. “We are delighted to be signing this new climate action loan with CDB, which is the result of a fruitful partnership that lasts for almost four decades, to support new projects in the Caribbean,” said Pim Van Ballekom, EIB Vice President. “This partnership is currently supporting CDB’s efforts to mainstream climate action to help its borrowing member countries (BMCs), which are all considered Small Island Developing States, to adequately tackle risks related to climate change. Caribbean countries face economic and social challenges which must be addressed whilst ensuring resilience to climate change,” he added. To date, CDB has committed the total resources under the ongoing Climate Action Line of Credit (50 million euro), for nine projects. This co-financing is associated with total project financing of approximately 191 million dollars (from CDB loans/grants, EIB CALC, counterpart and other sources of financing).